This Linen Closet is big enough for towels, linens and bath accessories. Approximately 68" high. Order #1112 Linen Closet hardware package separately. 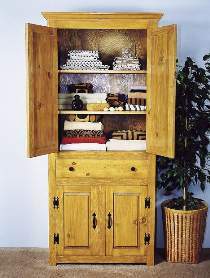 Linen Closet Hardware Package includes colonial hinges, handles and knobs, plus one pair 12" full extension drawer slides. Project plan, wood and wood finish are not included.